Bittersweet Enchantment: Book Bargain: Lamb To The Slaughter by Karen Ann Hopkins | 99¢ TODAY only! 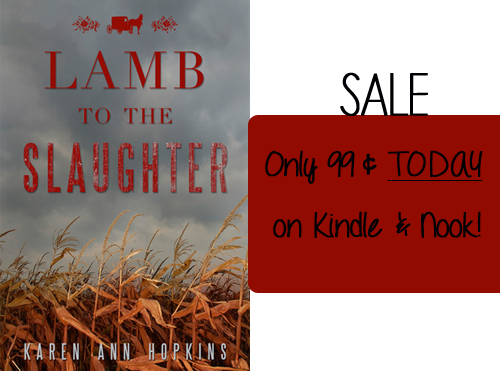 Book Bargain: Lamb To The Slaughter by Karen Ann Hopkins | 99¢ TODAY only! Hey everyone! *waves* I'm backkkk! :) Miss me? I've been asked by Karen Ann Hopkins one of my very favorite authors to share a REALLY amazing deal with my readers today. Her new Amish mystery is on sale for ONLY 99 cents and today is the final day to buy the book at this price. It's on sale on Kindle and Nook. You won't want to miss this deal! Pick up your copy below. Want to win a copy? Enter my giveaway here to not only win a copy of Lamb to The Slaughter but also signed print copies of The Temptation series by Karen Ann Hopkins.